President Obama is now better than a 4-in-5 favorite to win the Electoral College, according to the FiveThirtyEight forecast. His chances of winning it increased to 83.7 percent on Friday, his highest figure since the Denver debate and improved from 80.8 percent on Thursday. There are essentially three reasons that a poll might provide an inaccurate forecast of an upcoming election. The first is statistical sampling error: statistical error that comes from interviewing only a random sample of the population, rather than everyone. This is the type of error that is represented by the margin of error reported alongside a poll and it is reasonably easy to measure. If you have just one poll of a state, the statistical sampling error will be fairly high. For instance, a poll of 800 voters has a margin of error in estimating one candidate’s vote share of about plus or minus 3.5 percentage points. 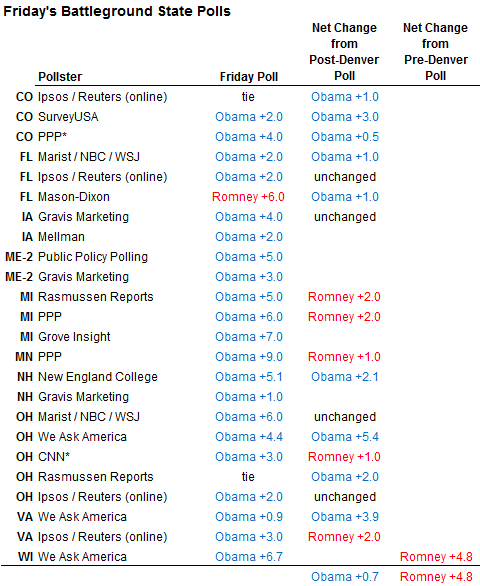 In a two-candidate race, however, the margin of error in estimating the difference between the candidates (as in: “Obama leads Romney by five points”) is roughly twice that, plus or minus seven percentage points, since a vote for one candidate is necessarily a vote against the other one. The margin of error is much reduced, however, when you aggregate different polls together, since that creates a much larger sample size. In Ohio, for example, there have been 17,615 interviews of likely voters in polls conducted there within the past 10 days. That yields a margin of error, in measuring the difference between the candidates, of about 1.5 percentage point — smaller than Mr. Obama’s current lead in the polling average there. So why, then, do we have Mr. Obama as “only” an 83.7 percent favorite to win the Electoral College, and not close to 100 percent? 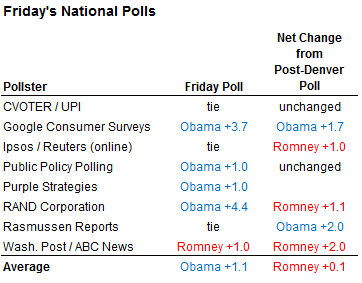 This is because of the other potential sources of error in polling. One is that a poll is a snapshot in time — even if you’re sampling the voters accurately, their opinions could change again before Election Day. This is a huge concern if, for instance, you’re conducting a poll in June of an election year. Michael Dukakis led the polls for much of the spring in 1988; John Kerry did so for some of the summer in 2004; even John McCain, in 2008, had a few moments when he may have been ahead in the polling average. Nor are there any more guaranteed opportunities for news or campaign events to intervene to alter the dynamics of the campaign, at least not at the national level. The debates have been held; the conventions occurred long ago; the vice-presidential nominees have been picked. The last major economic news of the campaign came on Friday, with the release of the October jobs numbers. A negative print on the payrolls report, or a sharp rise in the unemployment rate, could have altered the campaign, but instead the jobs report was a pretty good one. (I don’t expect the jobs report to produce much of a boost for Mr. Obama, but there’s little in the report that would aid Mr. Romney.) The recovery from Hurricane Sandy is still a developing story, but not one that seems to be playing to Mr. Romney’s benefit. There is the remote possibility of a true “black swan” event, like a national-security crisis or a major scandal unfolding at the last minute, but the chance for news events to affect the campaign is now greatly diminished. And most of the polls that we’ve seen over the past several days are the last ones that polling firms will be releasing into the field. That leaves only the final source of polling error, which is the potential that the polls might simply have been wrong all along because of statistical bias. Polling is a difficult enterprise nowadays. Some estimate that only about 10 percent of voters respond even to the best surveys, and the polls that take shortcuts pay for it with lower-still response rates, perhaps no better than 2 to 5 percent. The pollsters are making a leap of faith that the 10 percent of voters they can get on the phone and get to agree to participate are representative of the entire population. The polling was largely quite accurate in 2004, 2008 and 2010, but there is no guarantee that this streak will continue. Most of the “house effects” that you see introduced in the polls — the tendency of certain polling firms to show results that are consistently more favorable for either the Democrat or the Republican — reflect the different assumptions that pollsters make about how to get a truly representative sample and how to separate out the people who will really vote from ones who say they will, but won’t. ollsters are likely to make similar assumptions about how to measure the voter universe accurately. This introduces the possibility that most of the pollsters could err on one or another side — whether in Mr. Obama’s direction, or Mr. Romney’s. In a statistical sense, we would call this bias: that the polls are not taking an accurate sample of the voter population. If there is such a bias, furthermore, it is likely to be correlated across different states, especially if they are demographically similar. If either of the candidates beats his polls in Wisconsin, he is also likely to do so in Minnesota.